There are many elements which make an effective application. However, what I think stands out the most is the right mix between constraint and creativity. An iOS app that I have used quite a lot lately with this mix is Adobe Voice. Not only is it easy to use, but it allows for a great mixture of media, whether it be text, visuals, music or voice. 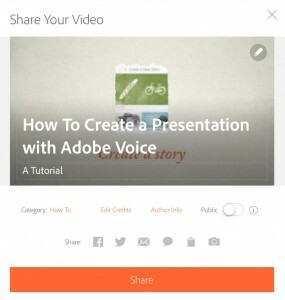 Here then is a step by step guide of how to make a presentation with Adobe Voice. 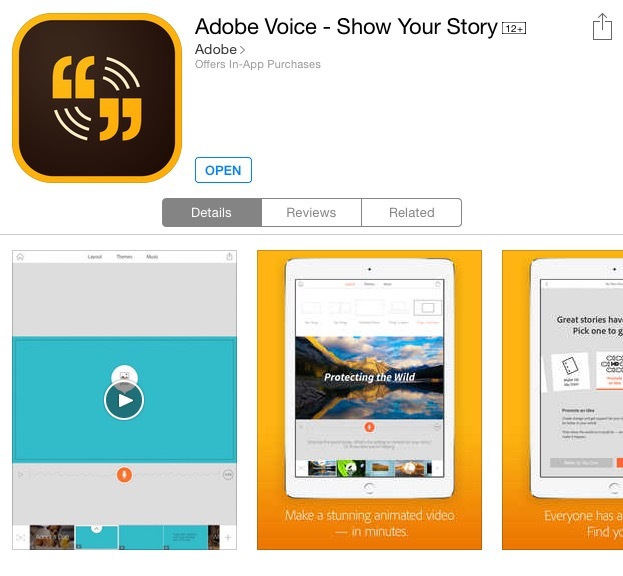 The first step to using Adobe Voice is to download it from the App Store. It is available on iPad. Once this is done, you will need to create a free Adobe account, used to store finished stories online. 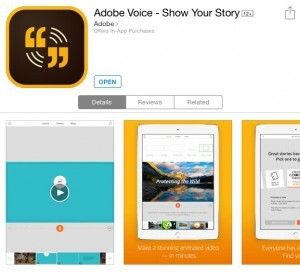 There are so many potentials to Adobe Voice. Once you have your head around the constraints then the sky is the limit. I have used it to get a class to reflect upon a project, share advertisements, solving a problem, celebrating goals, recording a poem or creating a how to guide. The thing to do then is start your story. Whether you are recording a book or sharing a problem that you have solved, the next step is deciding exactly what your story is going to be about. 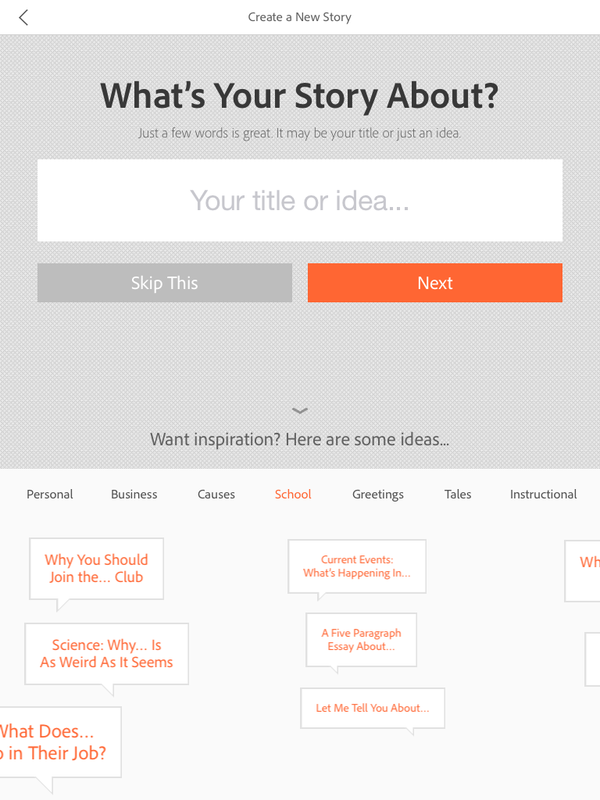 If you are short on inspiration and just want to be creative, Adobe also provide a whole lot of prompts listed within different categories, such as business, school and instructional. These can be helpful in getting a feel for the potential of the program. Each template provides a range of prompts about what to include. This can be useful for students exploring the different elements of text types or if you are simply trying to make something quickly. In addition to this though, you can simply create your own from scratch. It needs to be noted that you can start with a template and then modify that as well. 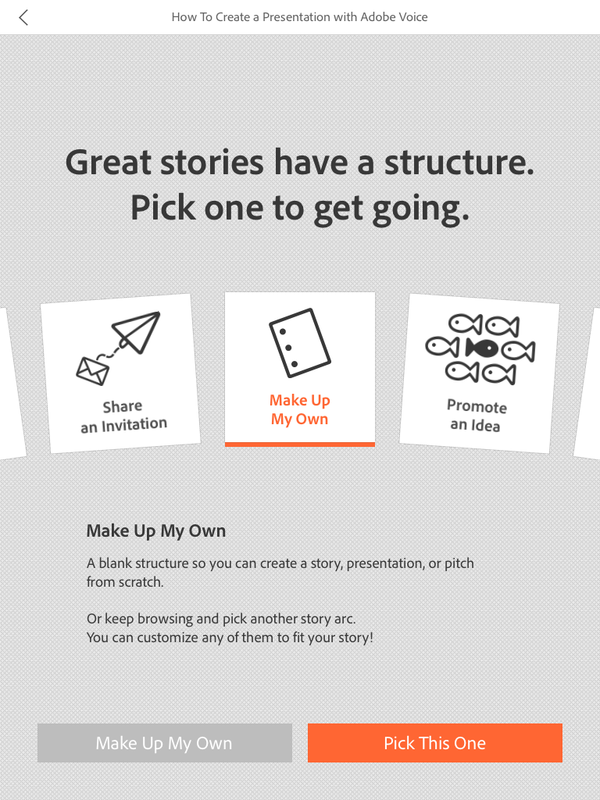 Once you have started your story, the first thing that you need to consider of the layout of your slide. There are five options. Some with a mixture of mediums, others with just one. It all depends what you are trying to create. Remember though that each slide can be different. Once you have selected the layout, then you add the content. As stated already, Adobe Voice allows for a range of different media. 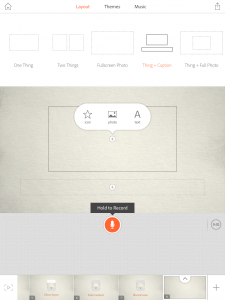 In regards to the slides, there are usually three options: icon, photo and text. At a very basic level, you can search for images and icons. Adobe then finds images online tagged ‘commerical use with modifaction‘ via sites such as Google, Flickr, 500px and the Noun Project. The catch with this is that such searches do not filter content, therefore students using it can come back with anything. In addition to this, you can connect with your own images via the iPad, Creative Cloud, Dropbox, Lightroom and Facebook. Once you have the text and images organised, the next step is to then record your voice. All you do is hold down the orange button and release it once done. At 10 seconds, you will receive a warning to keep it short. One thing that I have found is that in order to make sure you capture the whole thing, it can be good to hold the button for an extra second when recording. What I like the most is how easy it is to playback, assess, reflect and re-record if needed. To complete the story, you repeat the steps associated with layout, content and voice slide after slide until you have finished. 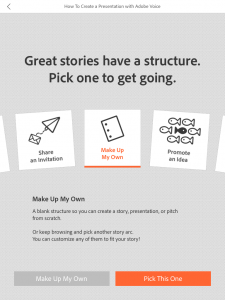 Before finishing your story, choose a theme. Each will structure the content differently, applying different effects. For those wanting more, you can customise themes by changing colours and fonts. Along with the choosing the theme, you can also select the music. There is a range of soundtracks provided, organised into different categories, such as happy, playful, relaxed and thoughtful. Like the image search, the tracks are all available under Creative Commons licensing. The final step is to share the finished product. You can actually do this at any time by clicking the button in the top right hand corner. Before publishing, you can assign a category, as well as edit the credits and author information. In addition to this, you can decided whether you want to make it public or private. By making it public, the video is stored within Adobe Cloud and gets added to the collection on the Adobe site, while keeping it private means that only those with the link can access it. To publish, you simply choose how you want the link shared, whether it be via Facebook, Twitter, email, iMessage or to the clipboard. A recent addition has been the option to save finished product to the camera roll. This provides the ability to then publish elsewhere online, such as to Youtube or Vimeo, and ‘co-claim‘. Although please note that once you have removed the content from iPad, you can no longer download to the camera roll. 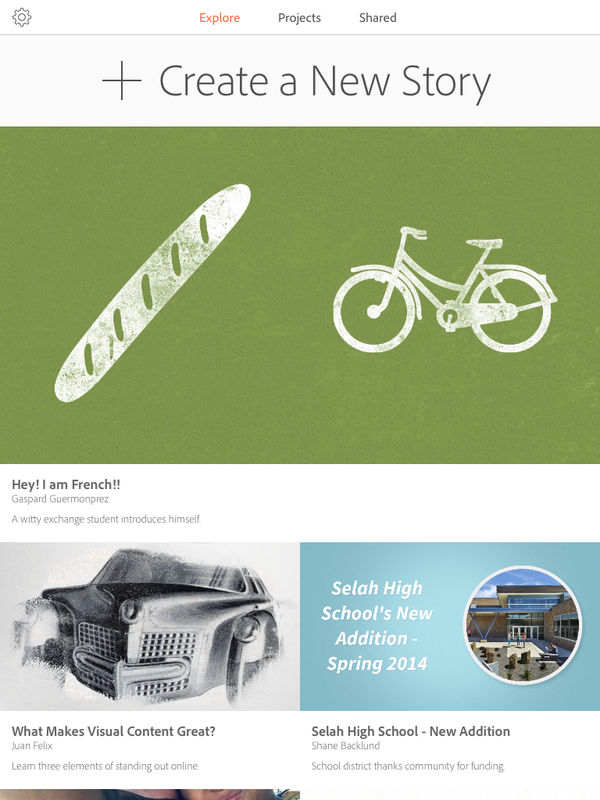 Once published online, Adobe provide options to embed the finished product to place within a blog or a portfolio. There are a range of programs out there that support presentations. 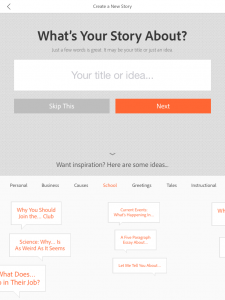 I think that you could easily create a similar product with Explain Everything or Book Creator, however what always brings me back again and again to Voice is its simplicity and style. This was a great introduction. Just what I needed to get me started.